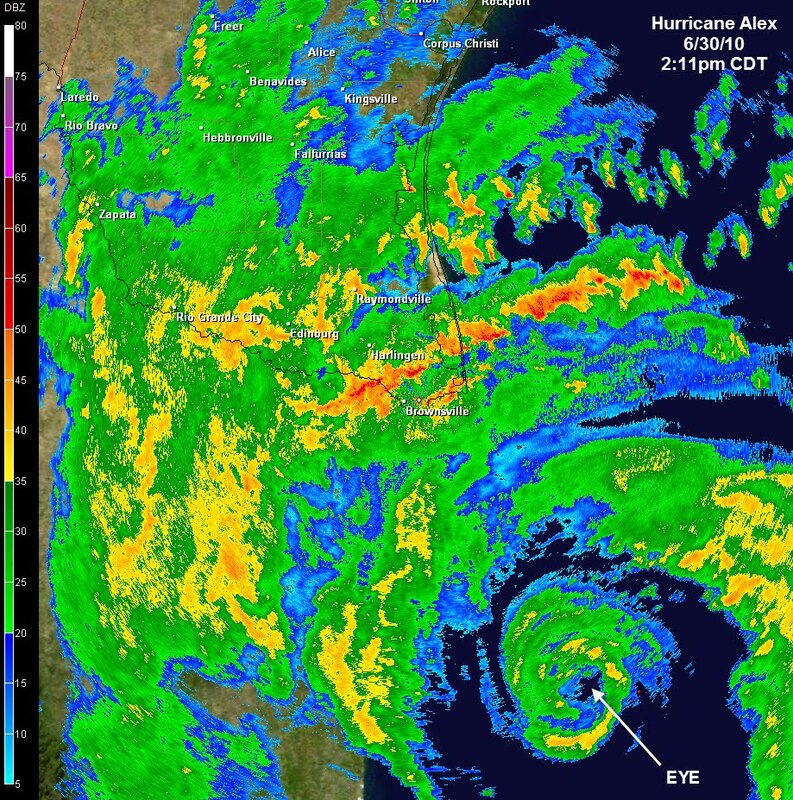 NATIONAL WEATHER SERVICE DOPPLER RADAR FROM BROWNSVILLE TEXAS AND AIR FORCE RESERVE UNIT HURRICANE HUNTER OBSERVATIONS INDICATE THAT THE EYE OF HURRICANE ALEX MADE LANDFALL AROUND 9 PM CDT... 0200 UTC... ALONG THE COAST OF MEXICO IN THE MUNICIPALITY OF SOTO LA MARINA... ABOUT 110 MI SOUTH OF BROWNSVILLE. MAXIMUM SUSTAINED WINDS AT LANDFALL WERE ESTIMATED TO BE 105 MPH... A CATEGORY TWO HURRICANE ON THE SAFFIR-SIMPSON HURRICANE WIND SCALE. Hurricane Alex, the first Atlantic basin hurricane in the month of June since 1995, is churning towards the Mexican coastline, about 100 miles south of south Texas and the Rio Grande Valley, this afternoon. Radar from mid-afternoon (above, click for larger image) shows that the eye of the category 1 storm is now evident on Brownsville, TX radar. With about 12 hours left until landfall (expected shortly after midnight tonight Central), time is running out for rapid intensification, though satellite and radar presentations are improving and the central pressure is much more indicative of a stronger hurricane than the wind fields are. The Hurricane Center predicts sustained wind will increase another 10-15 knots, making the storm a category 2 at landfall. The biggest threat to the U.S., however, will be flooding. Rainfall is expected to be between 6-12", locally up to 20", in south Texas where extreme rain events can easily cause massive flooding due to poor drainage and arid land. A storm surge of 3-5 feet above normal tide levels is also expected in exteme southern TX. The storm itself is so large that it is causing tropical rains and strong thunderstorms all along the Gulf Coast, where 4-6" of rain could fall from Houston to Pensacola. More information on Alex can be found on the MWN Tropical Weather page, as well as the National Hurricane Center website. Some of the best graphics on the web can be found at StormPulse.com. A disturbance traversing the southern Caribbean the past several days has continued to become more organized with deeper convection the past day or so and is now very near Tropical Depression strength (see satellite image above). The National Hurricane Center currently has a hurricane hunter aircraft investigating the system and could label the system T.D. 1 by the end of the day. As to where it's headed and how strong it will get... initially T.D. 1 will move into the Yucatan Peninsula and could bring heavy rain and gusty wind to the resort areas, including Cancun and Cozumel, this weekend. Whether it reaches Tropical Storm strength and gains the name Alex prior to that is questionable, but certainly possible. After moving across the Yucatan, the storm will emerge into the Bay of Campeche early next week. Where it goes from there is uncertain, however one group of models takes it northwest into the western Gulf of Mexico, possibly becoming a long-term threat to the TX/LA coastline. See a clutter plot of several various model solutions below. The MemphisWeather.net Tropical page will show the latest forecast tracks, intensities, and any watches and warnings that may be issued next week. The ridge of high pressure that has maintained a stranglehold on the Mid-South, bringing hot and humid conditions is weakening ever so slightly today, allowing a cold front to approach, but likely not pass through, the region. The additional dynamics (however weak) provided by the front will allow scattered thunderstorms to form this afternoon and linger into the evening and tomorrow as well. By Friday night, the front will retreat back to the north as high pressure re-builds for the weekend. Some of the storms today and tomorrow could be strong, with the main threat being damaging wind gusts, frequent lightning, and flash flooding due to their slow motion. Many areas may not see rain, but some areas could easily see 1-2" in an hour. Even with increased cloud cover, temperatures will still rise into the mid 90s with heat index values in the 100-105 range before storms starting firing by mid-afternoon. Storms will likely linger into the evening, decreasing in strength and coverage after 9pm. A repeat of today's weather is likely on Friday with more heating of the day thunderstorms that dissipate in the evening. Computer models indicate that while coverage will probably be higher over west TN and eastern AR today, higher coverage of thunderstorms may shift slightly south to southern west TN and north MS on Friday. As the high re-establishes itself this weekend, thunderstorm coverage will decrease, heat will increase slightly, and Heat Advisories may again be needed. By early next week, the high again weakens and there are early indications that a cold front will push all the way through the area, bringing scattered storms early in the week and a return to more "normal" conditions for this time of year by mid-week, with lower humidity values. Average highs for late June run near 90 degrees and lows typically hit 70 (upper 60s in suburbs). 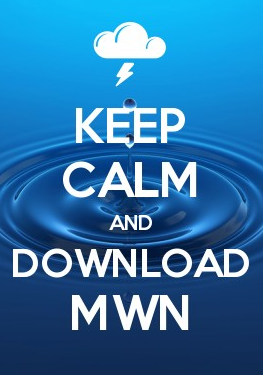 Check out the MWN Forecast for all the details for the upcoming week. Summer 2010 begins Monday, June 21! And you're probably thinking: "It's just starting?? What about all this heat we've had the past month??" Even though temperatures have been above normal for a month straight now, and it's been 94 or higher for eight consecutive days with no end in sight, the summer solstice officially takes place on June 21 at 6:28am CDT. So, while meteorological summer started on June 1 (and it seems more accurate this year given the weather), technically June 21 is the official first day of summer. The solstice is the point in time when the Earth's axis is most inclined toward the sun, yielding the longest day of the year for the Northern Hemisphere, thus the beginning of our summer. It is also the day when the apparent position of the sun is the highest in the sky for those in the Northern Hemisphere. 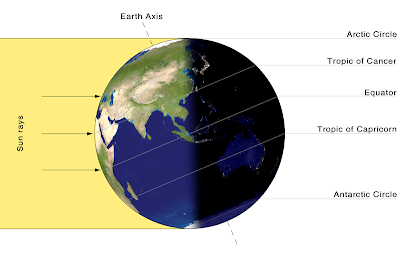 The graphic above shows the illumination of the Earth at the summer solstice. Notice that the areas around the Arctic circle get light all day as the Earth rotates, while those areas near the south pole are in darkness all day. So, even though we've already sweated through the month of June, welcome to summer! Take it easy! Strenuous outdoor activity should be reduced or eliminated, especially during the hottest part of the day. Spend more time in air-conditioned locations. Wear light-colored, loose-fitting clothing to help reflect heat and cool your body cooler. Wear sunscreen! Drink plenty of water or other non-alcoholic beverages, even if you don't feel thirsty. Alcohol speeds the dehydration process. Eat light, cool, easy-to-digest foods. Check on the elderly and chronically ill to be sure they are staying cool. Older people are especially susceptible to the effects of the heat, as are those with chronic illness such as respiratory diseases. Poor air quality often goes hand-in-hand with heat waves. Keep young children out of the heat. They can be as susceptible as the elderly. Provide plenty of water for pets, especially those outdoors, as well as a cool place to spend time during the hottest part of the day. Never leave children or pets alone in an automobile! Know your limits and respond to your body when it tells you to take a break. 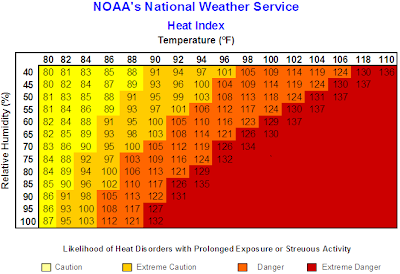 For more information, check out this detailed heat awareness webpage from the National Weather Service. 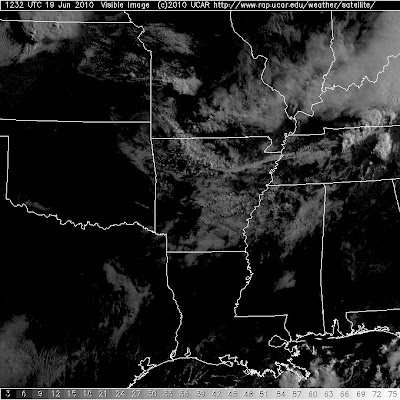 A large thunderstorm complex rumbled through the Ohio Valley overnight, producing a very large outflow boundary that can easily be seen on visible satellite this morning, as well as on Memphis-based radar. The first image above shows the visible satellite as of about 7:30am. Note the roughly east-west cloud line across the middle of west TN and northeast AR, extending back into the Ozarks. The radar image below that is from 8:05am and shows a dark blue (with a little green) line from Milan to north of Covington to Marked Tree and on to near Searcy. The outflow boundary is a wind shift with slightly drier and cooler air (very slightly) behind it according to weather observations on the back side of it. It is a line of convergence in the lower atmosphere so it has produced a line of clouds that can be seen on satellite and radar. The radar signature is also enhanced by dust, bugs, and other very lightweight objects that are picked up by the wind along the front/outflow. This outflow will likely move through the metro area in the next hour or so, but other than some clouds, I expect little effect on our sensible weather (temperature, humidity) other than a temporary wind shift to the north. 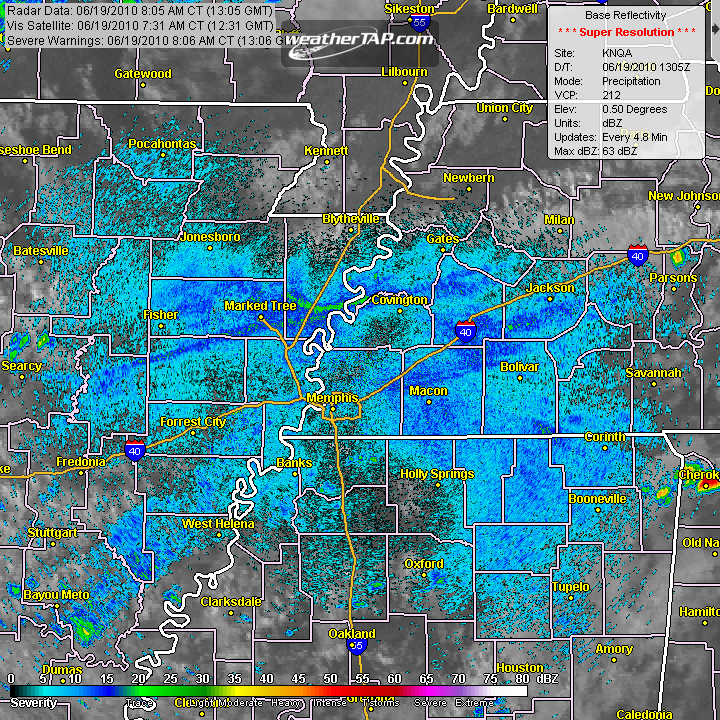 The outflow will likely weaken as it continues to move south, but could be enough to be the spark for isolated t'storms this afternoon, likely across north MS.
For a current looping radar view of the outflow, click "Current Radar and Satellite" on the tab above or click here. 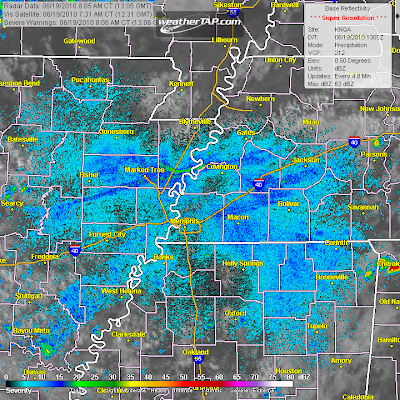 Not much has been posted on the MWN Blog of late, mainly because the Memphis area has had little to talk about weather-wise, other than the heat. So, since the heat doesn't seem to be going away, I'll talk about it! Unfortunately, the heat doesn't look to be abating anytime soon. The MWN Forecast shows high temperatures remaining in the mid 90s or higher (perhaps a couple of 100 degree readings across the region this weekend) through the end of next week with afternoon rain chances that provide some temporary relief dwindling. The unrelenting heat is due to a large dome of high pressure at the surface and aloft that covers most of the southeastern U.S. This "Bermuda High" typically doesn't start exerting it's full force until later in July and August. It strengthened early, therefore it feels like July a month early. The longer the heat lasts, the greater potential for negative consequences on the general public, but especially those who are very young, the elderly, and those with chronic illness or who work outdoors for long stretches. Be sure to check out, and follow, the National Weather Service's Heat Safety Tips as the heat wave continues. Wear light-colored, loose-fitting clothing. Take frequent breaks if outdoors. Drink plenty of non-alcoholic beverages, even if you don't feel thirsty. Don't forget to check on your pets and provide lots of water. And check on those more prone to heat exhaustion or heat stroke, especially those without air conditioning. Play it safe and stay cool! 2010 Atlantic tropical season ready to produce "Alex"? So far, two weeks into the 2010 Atlantic hurricane season, the tropics have been quiet. But that may change early this week as an area of low pressure over the north-central Atlantic has the potential to become the first tropical storm of the year - "Alex." The National Hurricane Center indicates that conditions appear favorable for some strengthening in the next couple of days as the system moves west-northwest at 10-15 mph. The graphic above (courtesy of StormPulse.com) shows where various tropical computer models have this storm going early this week. As you can see, none re-curve it out to sea, but bring it towards the Lesser Antilles/Windward Islands of the eastern Caribbean. 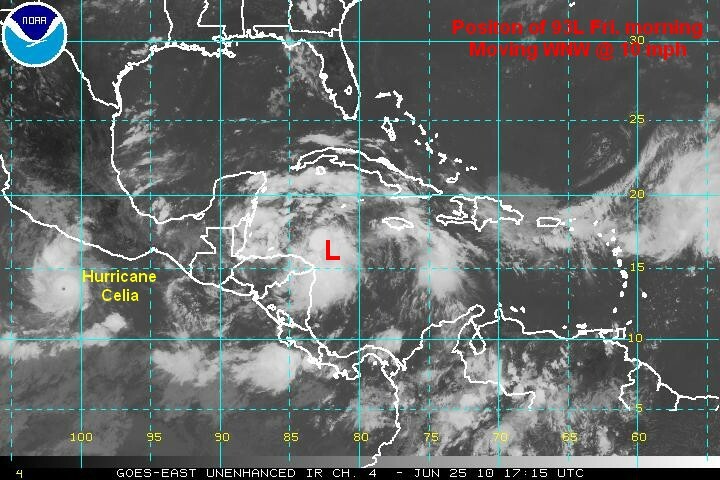 We'll continue to monitor this disturbance and bring you the latest official information on the MWN Tropical page. A WARM FRONT WILL SURGE NORTH THROUGH THE MIDSOUTH ON FRIDAY. CLOUDS AND PRECIPITATION MAY LIMIT HIGHS TO THE UPPER 80S OR LOWER 90S NORTH OF I-40... BUT ENOUGH SUN SHOULD BREAK OUT SOUTH OF I-40 AND ALLOW TEMPERATURES TO REACH THE MID 90S BY LATE FRIDAY AFTERNOON. COUPLE THIS WITH HIGH HUMIDITY AND HEAT INDEX READINGS WILL RANGE FROM 100 TO 105 ACROSS NORTHERN MISSISSIPPI AND EAST CENTRAL ARKANSAS. A DEEP TROPICAL SOUTHERLY FLOW WILL REMAIN IN PLACE AS A LARGE RIDGE BUILDS OVER THE LOWER MISSISSIPPI RIVER VALLEY THIS WEEKEND. HIGHS SATURDAY THROUGH MONDAY SHOULD RANGE FROM THE MID TO UPPER 90S ACROSS THE ENTIRE MIDSOUTH... WITH DEW POINTS LIKELY IN THE LOWER 70S. THIS WILL MAKE FOR HEAT INDEX VALUES AROUND 105 DEGREES EACH DAY. HEAT ADVISORIES WILL LIKELY BE ISSUED THIS WEEKEND. THE HEAT AND HUMIDITY WILL NOT SUBSIDE MUCH AT NIGHT WITH TEMPERATURES ONLY DROPPING INTO THE MID 70S IN MOST RURAL AREAS...TO AROUND 80 IN DOWNTOWN MEMPHIS. STUDIES HAVE SHOWN WHEN TEMPERATURES DO NOT DROP MUCH BELOW THE MID 70S AT NIGHT...PEOPLE WITHOUT SUFFICIENT COOLING PRACTICES ARE MOST SUSCEPTIBLE TO HEAT RELATED ILLNESSES BECAUSE THEIR BODY NEVER HAS A PROLONGED PERIOD TO COOL DOWN. 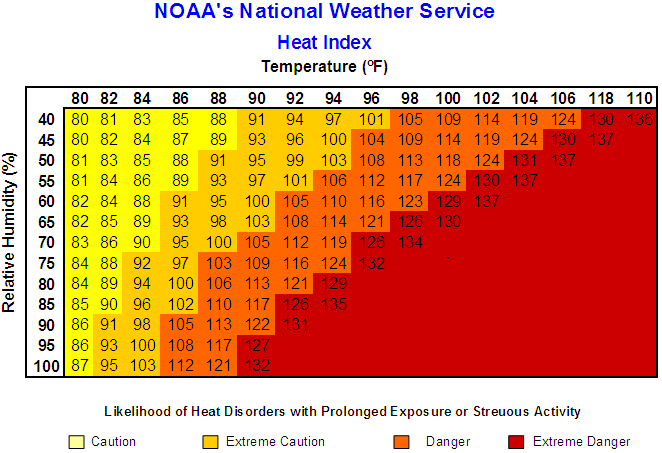 EXCESSIVE HEAT IS THE NUMBER ONE WEATHER KILLER. WHILE THIS PART OF THE COUNTRY SEES ITS FAIR SHARE OF SUMMER HEAT... THIS WILL BE THE FIRST HEAT WAVE OF THE SUMMER SO PEOPLE SHOULD BE ESPECIALLY PREPARED FOR THE DANGERS EXCESSIVE HEAT POSES. YOUNG CHILDREN... ELDERLY PEOPLE AND THOSE WITH ILLNESSES OR HEART CONDITIONS ARE MOST AT RISK. LIMIT OUTDOOR ACTIVITIES TO EARLY IN THE MORNING OR UNTIL EVENING. IF YOU HAVE A WORKING AIR CONDITIONER USE IT... OR AT LEAST OPEN WINDOWS AND ALLOW AIR TO CIRCULATE. 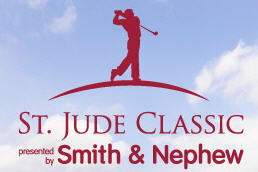 As much as Memphis in May events are associated with rain, the St. Jude Classic Golf Tournament hosted by TPC Southwind always promises to provide plenty of heat, humidity, and thunderstorm chances, but what else would you expect from a summer golf tourney in the Bluff City? An early week respite from the humidity will quickly be lost on the pros by the time rounds start later in the week. Here's the current weather expectations for the week's events. Monday, June 7 - Danny Thomas Pro-Am: A frontal passage on Sunday afternoon will bring low humidity values on Monday, but the heat will still be on with highs climbing to near 90 around 3-4pm. Skies will be partly cloudy for the Pro-Am, with a southeast breeze at 5-10 mph. Tuesday, June 8 - Pro's Practice Rounds: Humidity definitely starts creeping back up as those south winds increase. It will continue to be dry though with partly sunny skies. Early morning temps in the 70s will quickly reach the lower 90s by noon and top out in the mid 90s by mid-afternoon. Heat indices during the afternoon will reach near 100. Wednesday, June 9 - Championship Pro Am: Heat and humidity are in store with a chance of mainly afternoon and evening showers and thunderstorms. The rain chance is not high, so the golf course may stay dry, but a shower could be a nice respite from the heat! Early morning tee times will see golfers perspiring through 80 degree temps, which will quickly reach the 90 degree mark by noon. Mid 90s are expected once again in the afternoon with heat indices between 100-105 unless a t'storm pops up over the course. Thursday, June 10 - Round 1: A very similar day to Wednesday. Rain chances may be slightly higher on Thursday than Wednesday, and with more clouds temperatures should stay in the lower 90s in the afternoon. Expect a very muggy start even for those with early tee times. Rain showers or thunderstorms may not hold off until afternoon to start forming. Friday, June 11 - Round 2: Another sticky, hot day with rain chances similar to Wednesday - scattered at best. Once again, mid 90s are possible with heat index values in the afternoon in the 100-105 range. Morning rounds will be played with temps starting near 75, increasing to 90 by noon. Saturday, June 12 - Round 3 and Sunday, June 13 - Round 4: A very hot and fairly muggy weekend looks to be on tap. Both days, at this time, have the potential for mid 90s high temperatures mid 70s low temperatures, and heat index values at 100+ during the afternoon hours. Rain chances will be minimal - currently pegged at 20% during the peak heating hours of the day. Needless to say, with such a hot week ahead, all participants, spectators, volunteers, and tournament staff need to pay particular attention to staying hydrated (water or sports drinks are best), taking frequent breaks from the sun, and wearing appropriate attire and sunscreen, including hats and light-colored, loose-fitting clothing. Heat exhaustion or heat stroke can set in quickly if you do not take proper precautions. Taking the proper precautions will keep you from becoming a heat statistic. A warm and wet pattern in April continued into May, as temperatures were again above average and precipitation was record-setting in many locations across west and middle Tennessee thanks to an historic rainfall on and severe weather on May 1-2. 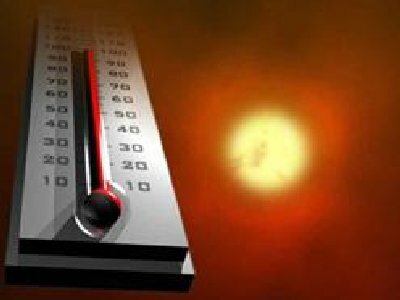 At Memphis Int'l Airport, the average temperature for May was 74.2 degrees, which was 3.6 degrees above normal. The maximum temperature for the month was 91 degrees on the 22nd and 23rd and the lowest was 52 on the 10th. No temperature records were set or tied in May. An historic storm system on May 1 that brought flooding conditions measured in the 100-500 year category for parts of the area, particularly Millington and Arlington, made May a wet month overall. There were 10 days during the month in which measurable precipitation fell, 4 of those with more than 1.00". The airport recorded a total of 9.26" of precipitation, which was 4.11" above average. The maximum precipitation in a 24 hour period was 3.51" on the 1st (continuing over from April 30th), but this amount paled in comparison to rainfall totals from areas north of the airport (see the Bartlett summary below for an example). The peak wind gust was 46 mph on the 16th. Click here for the NWS climate recap for May. The average temperature for May at the WXLIVE! station in north Bartlett was 73.1 degrees, about one degree cooler than the airport, with a maximum of 92.7 on the 23rd and a minimum of 48.9 degrees on the 9th. Precipitation was again the story of the month with several inches more rain falling in Bartlett than at the airport. May 2010 was the wettest month on record for the WXLIVE! station (which has been operating nearly 6 years). The automated WXLIVE! gauge recorded 15.01" of rain for the month, with 10.51" on May 1st! In fact, the monthly airport total of 9.26" was recorded in less than 5 hours on the morning of May 1 by WXLIVE! Subtracting that day, the total for the rest of the May still would have constituted an "above average" month. A co-located manual gauge used for the CoCoRaHS program measured 14.72" in May. There were 12 days with measurable precipitation, with 3 of those days recording more than an inch of rain. The peak wind gust was 29 mph on the 7th. Click here for a daily statistical recap on MemphisWeather.net. For the month of May, the average temperature error in all MWN temperature forecasts was 1.52 degrees, or nearly 0.20 of a degree better than the NWS and the best computer model. Nearly 80% of the MWN temperature forecasts for the month were within 2 degrees of actual. For dewpoint accuracy, the MWN forecast was also the best of the data sources at 2.27 degrees average error. More detailed accuracy statistics can be found here. In an update to my post from Monday, Colorado State University hurricane forecast experts Drs. Philip J. Klotzbach and William M. Gray released their early June Atlantic hurricane outlook this morning. Previously (on April 7), they had predicted 15 named storms, 8 hurricanes, and 4 major Atlantic hurricanes this year. Those numbers were all increased, as expected based on other recent forecasts and the conditions setting up in the Atlantic/Caribbean. Below are their forecast numbers as well as the long-term climatological averages. Their forecast reasoning is based on the same conditions discussed in my earlier posts and noted by other forecasters. These include a move from El Nino to neutral and eventually La Nina conditions this summer and fall resulting in weakened wind shear, anomalously high/near-record sea surface temperatures across the hurricane development regions of the Atlantic and Caribbean, a weak-than-normal Azores high over the Atlantic (again weakening wind shear that limits storm formation and intensification), and the fact that we are in the midst of a multi-decadal uptick in hurricane activity. Interestingly, in records dating back to 1851, only 5 seasons have seen 18 or more hurricanes and only 10 have had 10 or more hurricanes! 2010 could go down as one of the most active on record if these numbers hold true. Plus, with a forecast of 90 days with an active tropical storm or hurricane, the meteorologists tracking these systems will no doubt stay extremely busy! Read the entire report from Klotzbach and Gray here (PDF) and visit the CSU Tropical Meteorology Project page here. MemphisWeather.net's Tropical Weather page can be found here. The unofficial start of summer occurs on Memorial Day weekend, however the meteorological start of summer IS today as we in the weather business define summer for climate records as June-August. Though the summer solstice, and official start of summer, are still 3 weeks away, looking at the coming week's forecast would indicate otherwise! Today's high temperatures have reached into the lower 90s across the region with enough low-level moisture to push the heat index into the upper 90s. The same weather pattern continues tomorrow so expect more of the same. On Thursday afternoon and evening, we'll see a cold front move into the region but not all the way through, so look for scattered thunderstorms, a few of which could produce a damaging wind gust or hail. The front looks like it might linger around Friday, so another chance of thunderstorms is possible. Clouds will keep temperatures near 90 degrees for highs. Heading into the weekend, hot high pressure rebuilds over the region and temperatures will respond accordingly. Heat indices could top 100 for the first time this year on Saturday and Sunday as temps reach well into the 90s. Another frontal system could move in early next week, bringing another chance of storms. Today is also the beginning of the Atlantic hurricane season. Though storm formation is not imminent, MemphisWeather.net will have the latest information on each storm when what is expected to be an active season gets into high gear. MWN's Tropical Page is up and ready for action! Read more about the potential of the 2010 season, and why many coastal residents are on edge, in my previous blog post on the subject. You'll also want to bookmark two other sites for tropical weather information this summer: the National Hurricane Center, and one of my favorites - StormPulse.